. :: The Perils Of Show Jumping Sport - 6 ::. 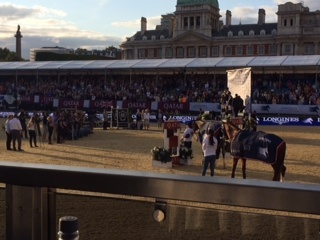 As I sit by the side of the stunning sun drenched London arena watching the top horses battling it out for the Longines Trophy - I am very glad I am not in Italian course builder Ulianos shoes!! 23 getting through to the second round - I'm sure he was wondering what on earth more he can do!! 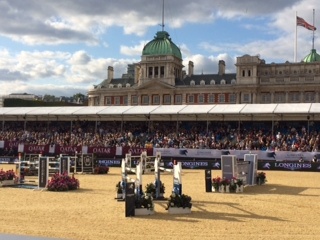 The problem is now with a field of 50 of the world’s top horses, these animals are no longer stretched at 160m nor phased by the technical twists - the only trick in the course builders tack box now is to tighten the time - and for sure that was the problem with the first round. It was by any standards big and tricky but without the extra pressure of the clock ticking in their ear, these course’s now just aren't challenging enough at this end of the sport to knock the field down in size - hence the 23 coming back in. The second round is a monster track and it will be interesting to see how many he catches now - but for sure these riders in the final jump-off are going to blaze around this arena quicker than the great fire of London itself!! This mare is really now getting into her stride - typically Irish she is now mature and has been a fantastic servant to the Team recently recording some super results in the top sport. 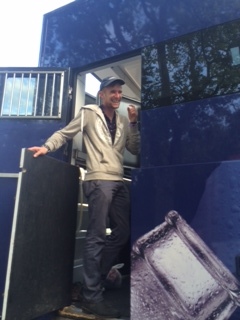 Grabbing a bite to eat after the late finish of the Grand Prix we get a call from Luke our groom that he "can’t get into the lorry....!" The lorry has electronic keypads on the doors - which were dead as the proverbial dodo! Luke was locked out and had no way to get in to his bed - but worse still when we asked Luke where the lorries actually were (they had been parked away from the show due to parking limitations in the middle of the city). He said "I haven’t a clue.....I think it's in Covent Garden market somewhere!!!" A treasure hunt across London ensued involving several taxis and phone calls - at one stage getting Luke to set off a flare was suggested! Until finally a slightly chilly Luke and the locked solid lorry were found and the battery Jerry rigged to get enough charge to get the lorry unlocked...and Luke was able to climb into bed. You’d think that would be the end of the saga - but nope - next morning at 7 am I got another call from Luke - this time he couldn't get out!!! The only suggestion I could make was he could climb out the window of his pod and scale down the side of the lorry....A-la-Spider-Man!!! Dedicated groom that he is Luke managed his great escape to get to the stables in time to tack up lady's queen for me - unfortunately I had the second last down in the speed class but at least we made it to the ring!! I leave this show with many fun memories of a super few days - with Pepper’s win, meeting up with many many old acquaintances from my days training in Wales and of course - laughter - lots of laughter - which is kind of the trademark of our Team!!! 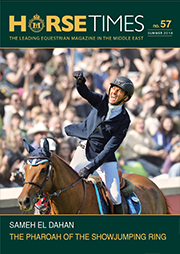 Until next time...the road to the Alltech FEI World Equestrian Games is getting closer. Photo: Luke trying out the door again!! !